There has been talks about the new german style in gardening, besides prairie gardening, recreating a desert hortensic culture in a middle european climate , the zen stone garden is very much “in style”. 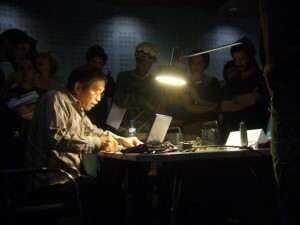 the concept of location and place in japanese culture has been philosophized by the Heidegger scholar Kitaro Nishida, i have been asked Tetsuo Kogawa to interprete his relevance for mini fm broadcasting projects such as Datscharadio, which happens in a east german garden turned into a artist run garden. >>Rethinking about Nishida: Every text has possibilities to think it further, think it over the original, and even to misunderstand. As you know, Nishida’s “basho” is his notion on his metaphysics. He tried to connect his metaphysics with some ideas of Zen (especially of Taisetsu Suzuki—he is much more interesting than Nishida and also influenced John Cage) and Japanese Buddhism. But I have to say that as long as you read Nishida’s Japanese texts they are written very esoterically. This is very different from Heidegger. As Erasmus Schoefer (Die Sprache Heideggers) brilliantly argued, Heidegger’s language is ‘logical’ (in Husserl’s term it should be in “transcendental logic” not “formal logic” though). Nishida is not like this. His texts are pretentious. Also, there is a problem of Japanese language. It is totally different from German. Basically it is ambiguous. In this sense, the translation is only one interpretation of his text. Semiologically, you can use his texts freely. In fact, many new ideas derived from a kind of mistranslation from Greek texts of the philosophers. Mistranslation might be indeed the source of many hortensic adaptions in ongoing gardening trends. Tetsuo Kogawa is a pioneer in D.I.Y. micro fm movement, using micro fm transmitters as artistic musical instruments with his live performances and building of radio transmitters in workshops, his open hardware circuits have been built all over the world to make analogue micro radio a form of art.